We tried to get to Povoa De Varzim today but failed! We motored out of Bayona into a massive swell (as usual there was no wind). We phoned the marina in Povoa at 1000h when they opened to check if we could get in and unfortunately they said ‘it was not possible’. We had heard a number of reports that they were not accepting visitors as the visitors pontoon is too exposed in the swell, hence the phone call to check. The next port is Porto de Leixoes, which we probably wouldn’t have made in daylight, particularly as the swell would have slowed our progress. The swell was so big you couldn’t see the fishing boats never mind the pot markers! 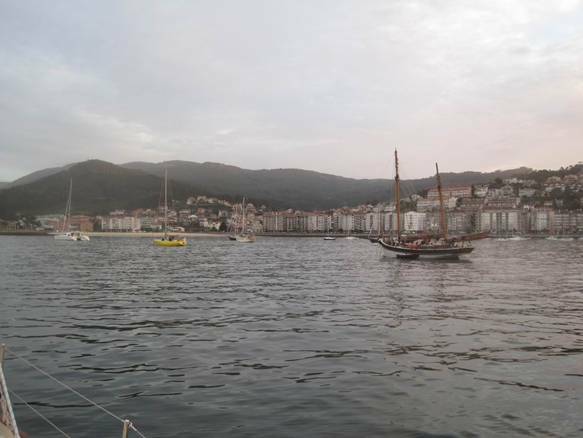 With the big swell, worsening forecast and some coastal fog which was present when we left we didn’t fancy closing the coast and entering Leixoes in darkness, so reluctantly we turned back to Bayona. No one else had moved but at least we tried! For a change of scenery we anchored in the bay rather than go into the marina. Not only is this a lot cheaper (it’s free to anchor), it’s a lot more pleasant as there was a lot of surge in the Marina. The number of boats in the anchorage is steadily increasing as people wait for the weather to improve. Tomorrow (Thursday), Friday & Saturday the weather forecast is bad (strong southerly winds), so we know we are now stuck here until the weekend. 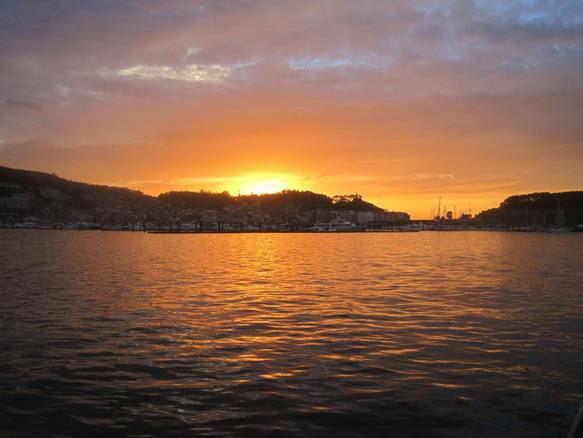 Sunset over Bayona from the anchorage. The view is much better here than from the marina.